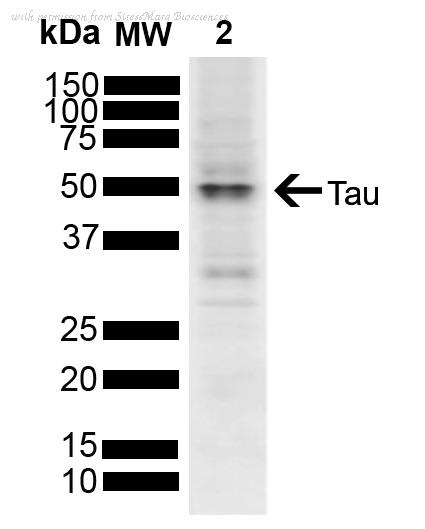 The TAU antibody from Proteintech is a rabbit polyclonal antibody to a recombinant protein of human TAU. This antibody recognizes human, mouse, rat antigen. 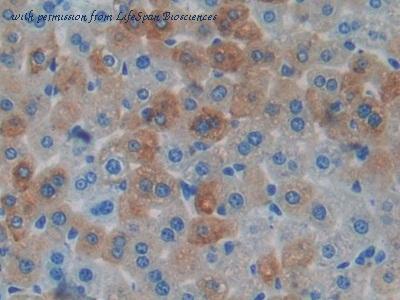 The TAU antibody has been validated for the following applications: ELISA, WB, IHC analysis. 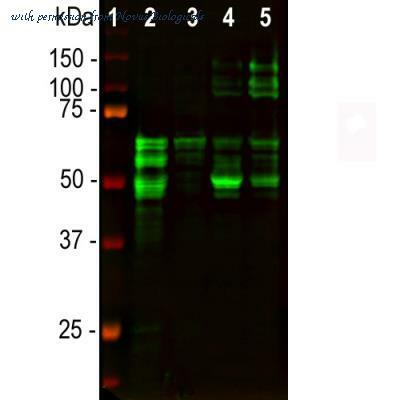 Western blot analysis of Mouse Brain cell lysates showing detection of ~47-70 kDa Tau (pSer396) protein using Rabbit Anti-Tau (pSer396) Polyclonal Antibody (SPC-1436). Lane 1: Mouse brain cell lysates and antibody incubated with the immunizing peptide. Lane 2: Mouse brain cell lysates. Load: 10 µg. 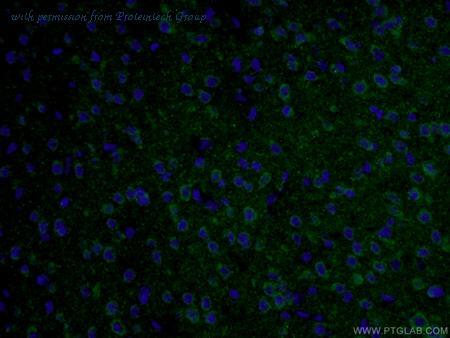 Primary Antibody: Rabbit Anti-Tau (pSer396) Polyclonal Antibody (SPC-1436) at 1:1000. Predicted/Observed Size: ~47-70 kDa. 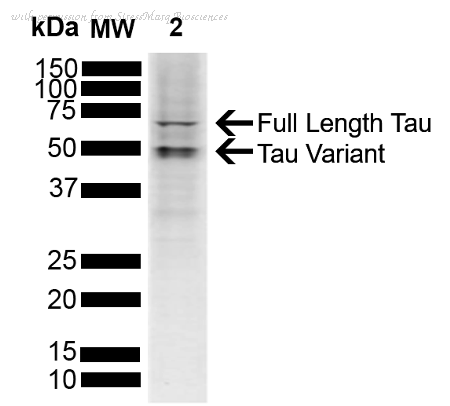 Western blot analysis of Human SH-SY5Y cell lysate showing detection of ~45.8 kDa Tau protein using Rabbit Anti-Tau Polyclonal Antibody (SPC-801). Lane 1: Molecular Weight Ladder (MW). Lane 2: Human SH-SY5Y cell lysate. Load: 10 µg. Block: 5% Skim Milk powder in TBST. Primary Antibody: Rabbit Anti-Tau Polyclonal Antibody (SPC-801) at 1:1000 for 2 hours at RT with shaking. 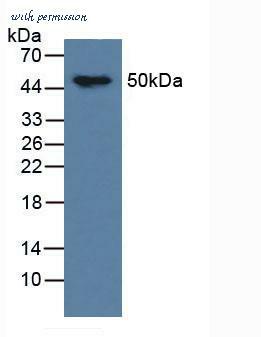 Secondary Antibody: Goat anti-rabbit IgG:HRP at 1:4000 for 1 hour at RT with shaking. Color Development: Chemiluminescent for HRP (Moss) for 5 min in RT. Predicted/Observed Size: ~45.8 kDa. Other Band(s): 50 kDa, 65 kDa. 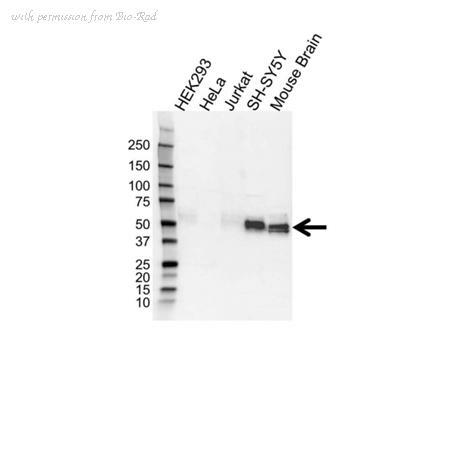 Western blot analysis of Human SH-SY5Y cell lysate showing detection of ~45.8 kDa Tau protein using Rabbit Anti-Tau Polyclonal Antibody (SPC-802). Lane 1: Molecular Weight Ladder (MW). Lane 2: Human SH-SY5Y cell lysate. Load: 10 µg. Block: 5% Skim Milk powder in TBST. Primary Antibody: Rabbit Anti-Tau Polyclonal Antibody (SPC-802) at 1:1000 for 2 hours at RT with shaking. 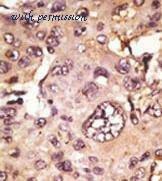 Secondary Antibody: Goat anti-rabbit IgG:HRP at 1:4000 for 1 hour at RT with shaking. Color Development: Chemiluminescent for HRP (Moss) for 5 min in RT. Predicted/Observed Size: ~45.8 kDa. Other Band(s): 50 kDa. Western Blot; Sample: Mouse Brain Tissue. Immunocytochemistry/Immunofluorescence: Tau Antibody (2E9) [NBP2-25162] - E18 primary rat hippocampal neurons (from Neuromics) were fixed and immunostained with NBP2-25162 (green), chicken antibody to alpha Internexin (NBP1-05208, red) and for DNA (blue). 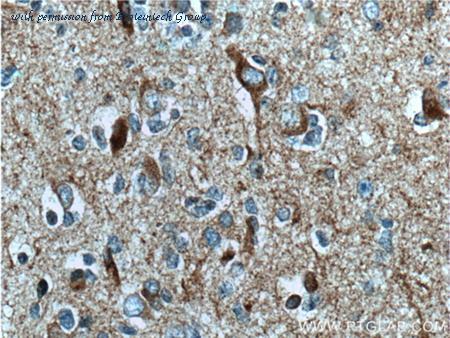 NBP2-25162 stains the neuronal perikarya and processes strongly, and does not stain non neuronal cells in these cultures. The alpha Internexin antibody stains intermediate or 10nm filament bundles in the cytoplasm of these cells. 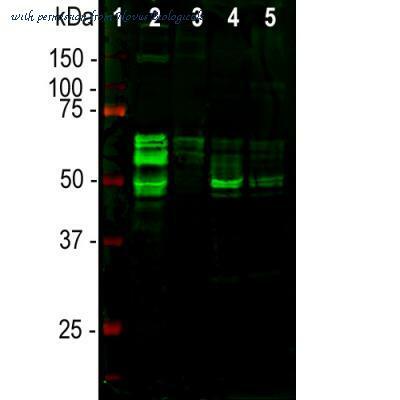 Western Blot: Tau Antibody (2E9) [NBP2-25162] - Blots of crude rat brain extract, revealing, as expected, multiple bands in the range 48-67kDa. 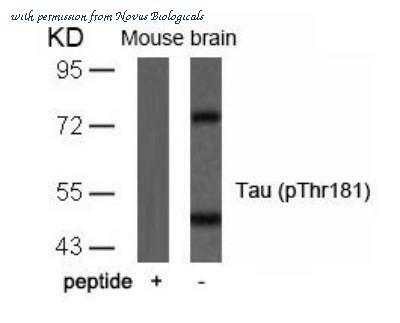 Western Blot: Tau [p Thr181] Antibody [NB100-82245] - Analysis of extracts from mouse brain tissue using Tau(Phospho-Thr181) Antibody and the same antibody preincubated with blocking peptide. Western Blot: Tau Antibody [NBP2-25163] - Analysis of tissue lysates using chicken pAb to MAP-tau, NBP2-25163, dilution 1:10,000 in green:  protein standard (red),  rat brain,  rat spinal cord,  mouse brain,  mouse spinal cord. 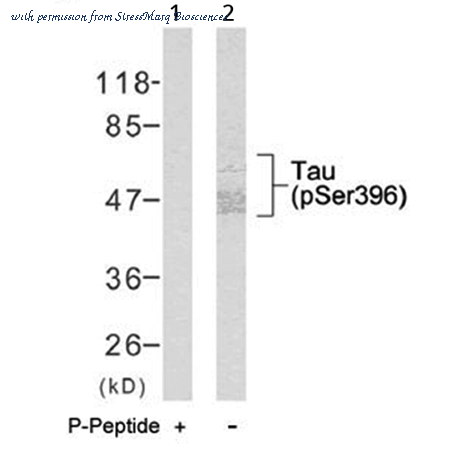 Tau protein is expressed as multiple isoforms of different molecular weight, and so appears as multiple closely spaced bands in the region of the blot in the range from 48 kDa to 67 kDa.